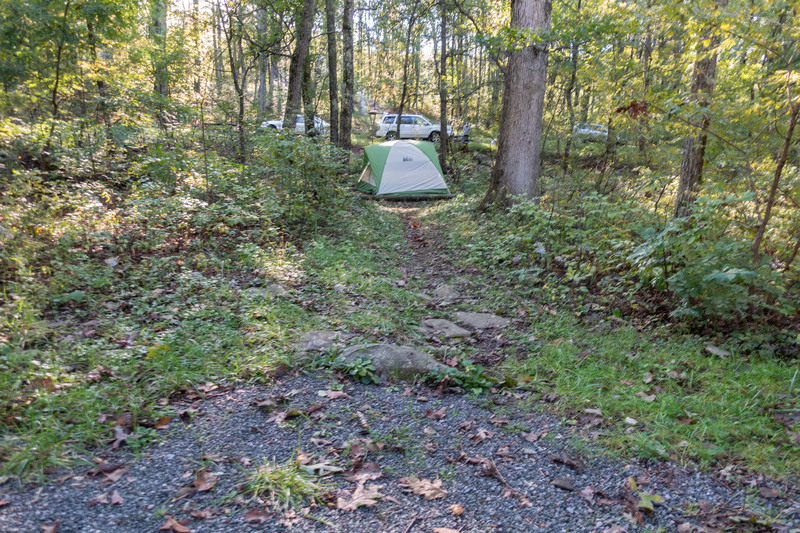 Since the last time we had camped there, Mathews Arm Campground had been updated, and we were interested to see how it had changed. In past visits, we had reserved one of the sites between A42 and A55, but you can no longer book those in advance. Instead, we grabbed the last site available for a weekend in late September, site C150. We made it! Of course, this was taken on our way out, since we arrived when it was dark. We chose to pitch our tent on the designated tent platform, though you could put it on the gravel instead. After work on a Friday, we arrived at Mathews Arm Campground around 8pm. 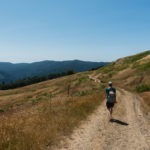 This was later than we wanted, but we still looked forward to a weekend of both relaxing and hiking. We went into the restrooms to brush our teeth and discovered a welcome addition – handsoap. In the past, there had only been hand sanitizer. The campground seemed unusually crowded, probably due to the density of campsites in the C-loop. That night, we could hear people talking until after midnight. Many were still out around their campfires – some were yelling, others were playing loud music. We’ve found other campgrounds in national parks to be quiet; even Seawall Campground in Acadia, which has some crowded areas, was much quieter. We didn’t see any rangers or campground staff around, so I guess no one was enforcing quiet hours. It’s hard to get quality sleep while camping, and the constant noise made it hard to fall asleep. Conversely, it’s generally been very quiet at night during previous visits. During a past visit, we even heard a ranger asking campers to let her know if other groups were disturbing them. 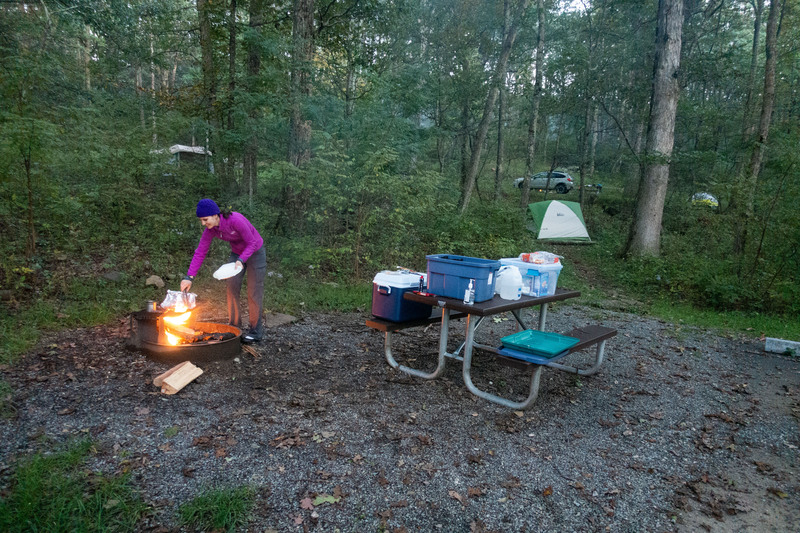 In the morning, we discovered we had forgotten our camp stove. 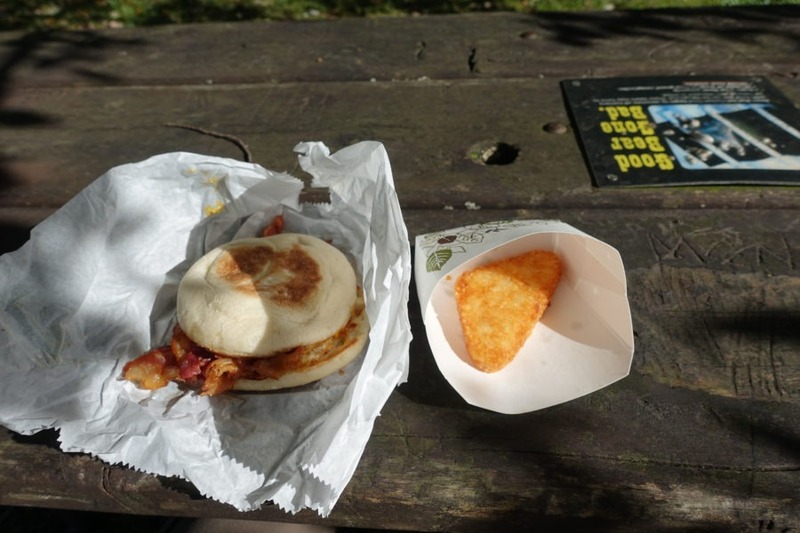 So went to Elkwallow Wayside, a nearby camp store, to grab some breakfast. We had been there several times in the past to get firewood and random supplies we had forgotten at home. 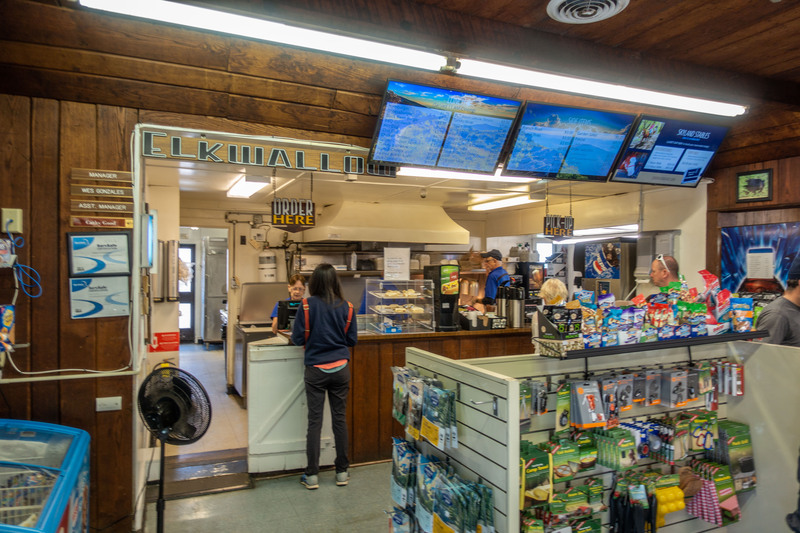 Elkwallow is about 3 miles from Mathews Arm and also has gift shop items and basic hot food. T got a bacon, egg, and cheese muffin with hashbrowns, and I got sausage and egg on toast, also with hashbrowns. The servers were friendly and very accommodating of my dietary restriction. 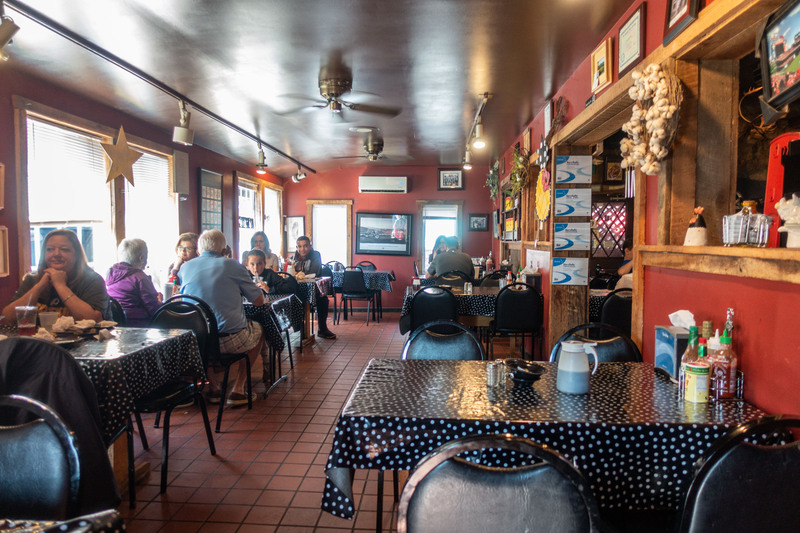 All the seating is outdoor, which you might expect. So we ate our breakfast at a sunny picnic table. 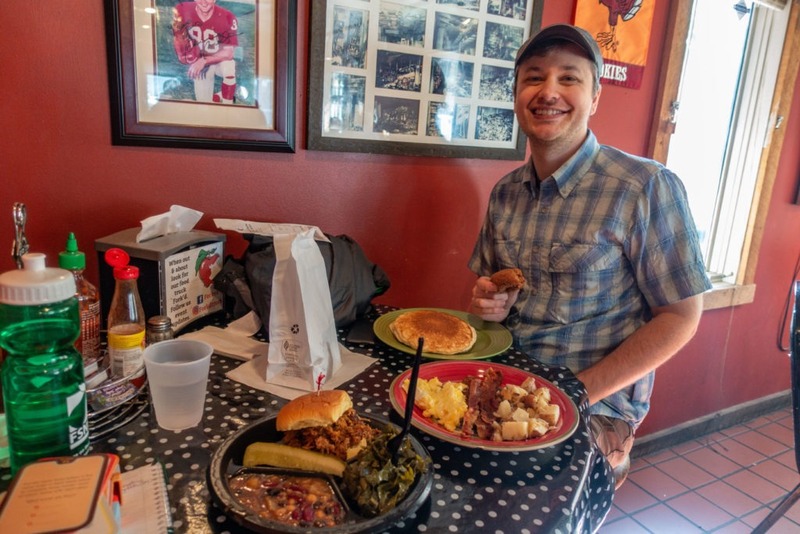 The food was kind of like what you’d get at a fast food place. It filled us up and was better than cold pop-tarts. After breakfast, we were both ready for a day of hiking. 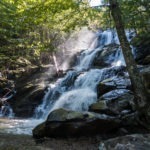 We had recently done a backpacking trip at Overall Run Falls, which is near Mathews Arm. 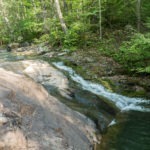 So we decided to drive a bit further and hike a loop trail for Dark Hollow Falls and Rose River, which is close to Big Meadows Campground. When we returned to the campground that evening, we had to rely on our fire-building skills and the campsite grill since we had forgotten our stove. We had trouble getting it to light, but a couple in the adjacent site helped us out by giving us some fire starters. And we gratefully headed on to our main course of hot dogs and canned beans. And of course, s’mores! After our gourmet meal, we cleaned up and slowly made our way toward our tent. We wondered if people would be loud again. To prepare ourselves for what might be a long night, we brought a national parks Trivial Pursuit deck we had bought at a gift shop on one of our adventures. It was a good thing we had something to do, and we were surprised to hear people making noise again until well after midnight. Somehow, we finally got to sleep. 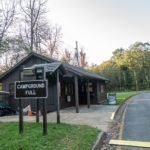 In the morning, we packed up and drove around the campground to see whether any other major changes had taken place, aside from the addition of hand soap. 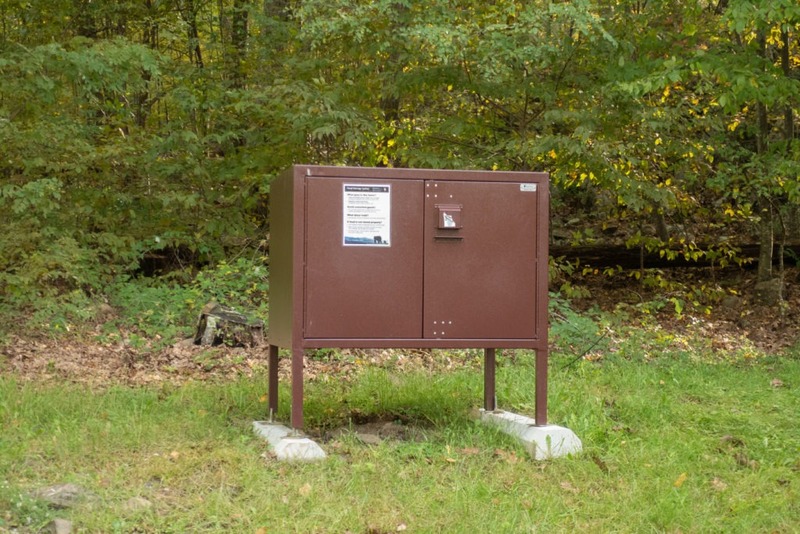 It looked like bear boxes had been added to campsites on the perimeter of the campground. Sites A23 through A53 (odd) seem relatively private. These sites also have pull-through parking rather than back-in, which we prefer. Sites A1 through A15 (odd) are relatively isolated from other sites, but will get more traffic since all vehicles entering the campground have to drive through this area. 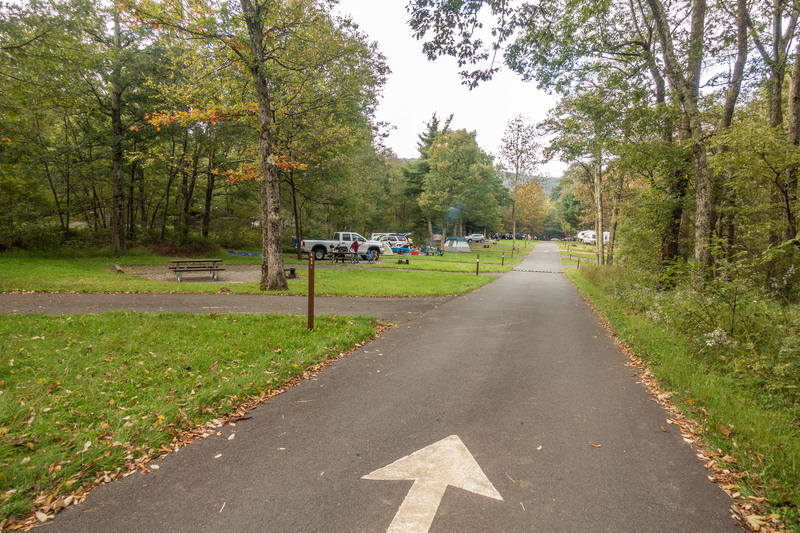 All traffic must exit past sites A72 through A116, so there may also be more traffic in this part of the campground. However, the sites on the perimeter of the campground (mostly even-numbered sites) looked spacious. On our way out of the park, we stopped at Apple House, a popular restaurant in Front Royal, Virginia, to grab brunch. 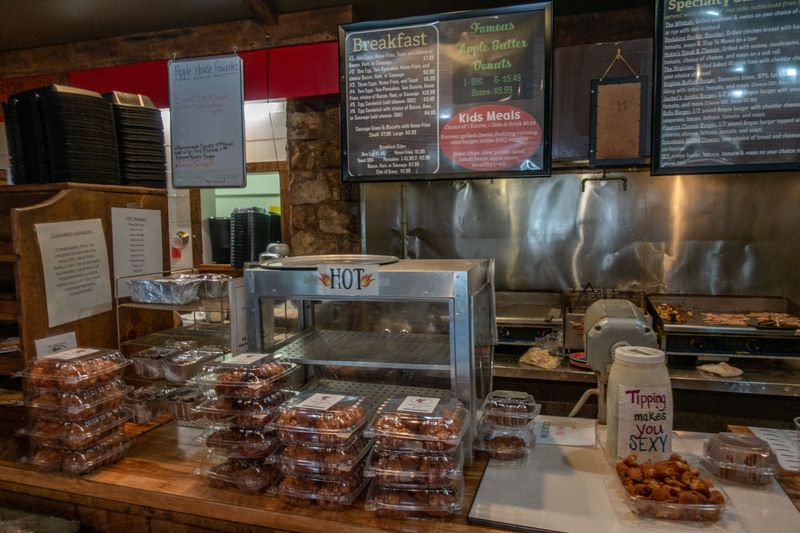 The place is well-known for its doughnuts and located close to Shenandoah’s northern entrance. 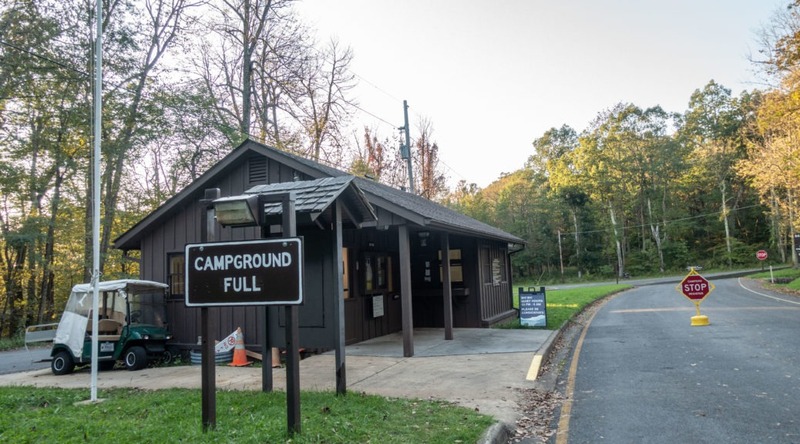 While we munched on pancakes and pulled pork, we discussed our thoughts on the changes to our most-frequented campground. Overall, we couldn’t argue with the changes to the campground itself, namely bear boxes and hand soap. 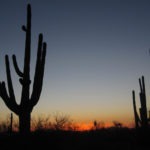 But we were disappointed in the noise and the change in the site reservation system. We hoped the late-night noise was a fluke. We also questioned why the denser sites are reservable, while the quiet, less-dense sites are walk-in only. We’ll probably go back and try for a walk-in site, but I wouldn’t stay in the C-loop again. I might reserve a site on the B-loop in hopes that it would be quieter. 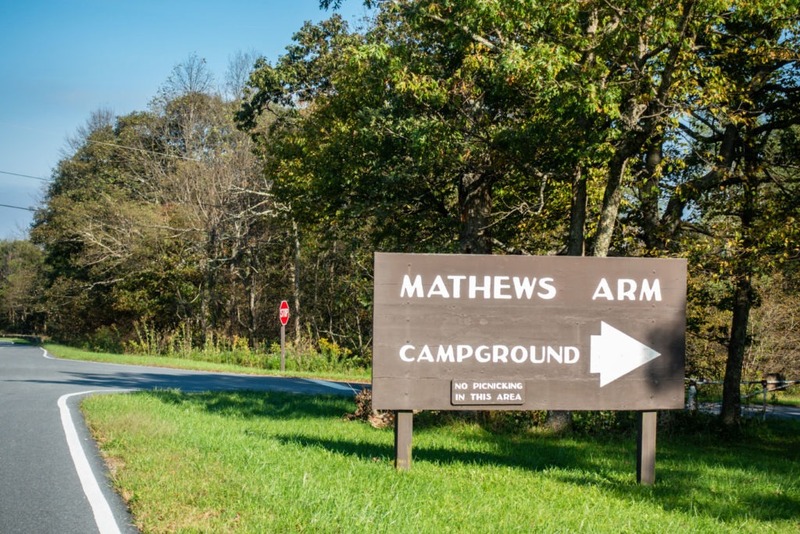 Either way, we hope our next visit to Mathews Arm Campground is more peaceful. Best Sites: Perimeter sites on A loop and generator-free sites on B loop. Avoid C Loop if you’re looking for peace and quiet. Notes: Sites B117-B141, C146-C164, and D165-D167 (group sites) can be reserved up to 6 months in advance. Generator-free sites are A42-A64 and B128-B141. 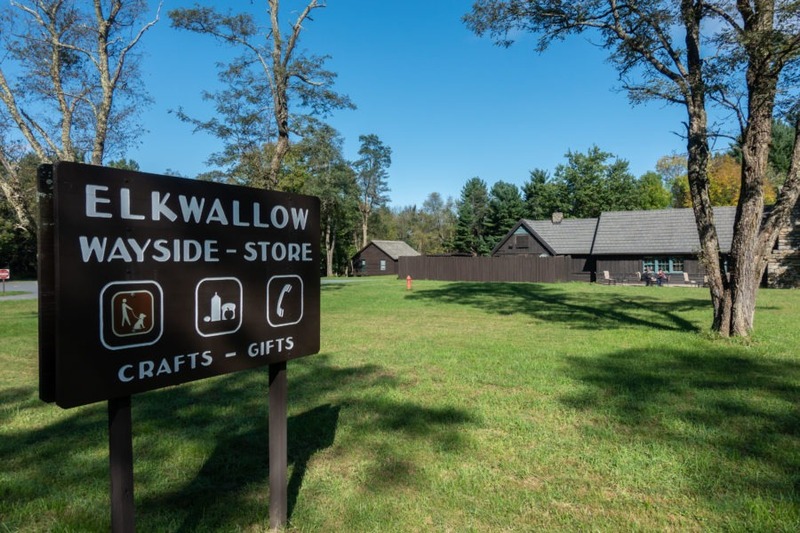 Elkwallow Wayside is less than 3 miles away for camping supplies.